Fresh detailed reports are beginning to emerge as to the real reason behind the recent clampdown on officials of the Nigerian judiciary, a very distressing and unfortunate incident which occurred during odd hours of Friday 7 October and Saturday 8 October, 2016 amidst wide condemnation from members of the general public. Further irrefutable evidence has surfaced regarding the smokescreen intimidation of judges who had in one time or the other ruled against the wishes of the government, in the name of fighting judicial corruption. Recall that the midnight raid on homes and illegal arrest of judges by operatives of the Department of State Services (DSS), included Justices John Inyang Okoro and Sylvester Nguta of the Supreme Court, Justices Nnamdi Dimgba and Adeniyi Ademola of the Federal High Court, Abuja and three others. They were arrested over allegations of corrupt practices, another lie which unsurprisingly is now a trend and trait of the DSS since Buhari bulldozed his way into power. 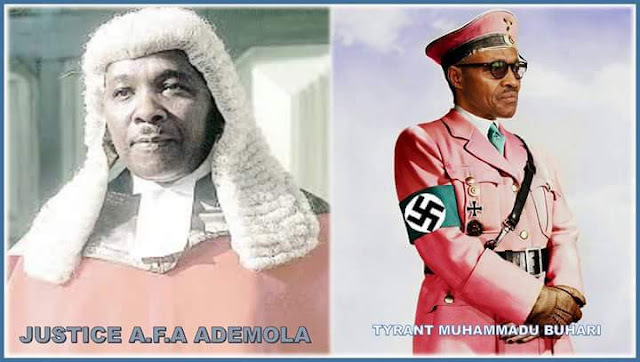 However, it should be placed on record that the trigger for the unwanton arrest of Justice A.F.A Ademola and other reputable judges had nothing to do with election results or corrupt practices but rather, it was against the backdrop of Nnamdi Kanu’s recent application for contempt of court proceedings against the tyrannical government of Nigeria led by Buhari, which as the presiding judge in the original case that hitherto granted him bail, lies the legal responsibility to hear the appeal in his court. On the part of Justice Nnamdi Dimgba of the same Abuja High Court, it should be recalled that on Monday, 8th August this year, the judge had said its (FHC) will stop granting applications filed by the DSS until all previous orders of the court are obeyed and executed. He made this statement when the DSS Counsel, GOA Agbadua, brought an application for a remand warrant. Dimgba had been furious after the court ordered the detention of Air Commodore Umar Mohammed (Rtd.) who was arraigned before him in Kuje prison pending the hearing of his bail application, but the DSS in their usual manner, flagrantly disobeyed the order and kept him in its custody. Dimgba also cited another instance when he ordered the Service to produce some accused persons in court but noted that the DSS had yet to comply with the directive. Going by this consistent disobedience to court orders, one is justified to ask " Is the DSS under Buhari’s command above the laws of Nigeria"? This wild-goose-chase embarked upon by Buhari and his urchins was also in connection of the DSS’ refusal to obey court orders for the immediate and unconditional release of the leader of the Indigenous People of Biafra, Nnamdi Kanu on two previous occasions. Hence, Justice Dimgba’s arrest and invasion of his house cannot be said to be unconnected with his strict stance for the adherence to the rule of law. Now we must bear in mind that only on Friday the 7th of October 2016 Justice Ademola issued two rulings in a case brought against DSS by two persons whose fundamental human rights were breached because they were illegally detained by the same DSS. Justice Ademola awarded the sum of N20 million and N10 million respectively to the complainants as compensatory fines against the government for the violation of their rights. The odd hour timing of his arrest is troubling because DSS know Ademola is covered by what is termed “constitutional immunity” which means that you cannot arrest a sitting judge over his rulings but rather you appeal against it. Buhari’s government no doubt has shown once again that Nnamdi Kanu remains a threat to their continued existence in a corrupt artificial British empire, and perennial exploitation of Biafrans and her resources. If Buhari is under the illusion that Nnamdi Kanu was unjustifiably released by justice Ademola, the proper thing to do would have been for his dogs, the DSS, to appeal his ruling. But like a drowning man looking for whom to drown alongside, Buhari decided to play dirty by tarnishing the image of these judges using a man like Femi Falana who can be compared to a paralegal, as he has proven to be bereft of knowledge with respect to constitutional immunity as applicable to judges of high standard. Reliable information reaching BIAFRA WRITERS has it that DSS in the afternoon, 11th of October 2016, stormed the office of Mr. Kenneth I. Gudugu the registrar of Court 7 of the Federal High Court Abuja, which incidentally happens to be Ademola's court as well, demanding copies of Ademola's ruling in the case of Nnamdi Kanu and Sambo Dasuki. With all this unwholesome actions being displayed by the Buhari-led government, one is left to wonder and ask pertininent questions such as; why the DSS who have copies of the rulings in their own file, are demanding same file from Mr Kenneth? why are they harassing a fearless judge like Ademola who refused to be intimidated by the DSS? Whatever is the motive behind this clandestine operation of the DSS is not far fetched. They obviously want him to rewrite and reverse under duress, his would-be judgement ahead of the appeal for contempt of court proceedings filed by Kanu's lawyer. Buhari's so called fight against Judicial corruption is nothing but a farce. It is lopsided and a ruse geared at fooling the public who has little or no knowledge of the basis for the arrest of an upright judge like justice Ademola. While on the other hand, we still have John Tsoho who happens to be the most corrupt judge in Nigeria, a man who has perverted justice in Kanu's case, lied under oath and broken every law guiding legal profession; shamelessly roaming freely in the iconic black robe. Why didn't the DSS go after such a man, if not because he is the only judge that is known, capable and proven to be a willing tool to every incumbent government right from time immemorial? The timely shakedown of the judiciary is geared towards making judges susceptible to pressures from the executive arm of the government which on the long run, spells doom and mark final collapse of the judiciary’s independence and privileges. It is regrettable that the world especially Barrack Obama who played a major role in forcing Buhari upon the masses, have continued to maintain deafening silence as the reign of terror unleashed upon men of high intellect by a tyrant without a certificate continues. The world should be seriously concerned over the wave of arrests, intimidation and harassment of judges across the country by agents of the DSS. While they may support the government’s efforts to eradicate judicial corruption, we cannot accept anti-corruption strategies and methods which patently offend the rule of law and undermine the authority, integrity, sanctity and independence of the judiciary. We believe that strategies and methods to sanction suspected corrupt judges must never have an inhibiting or chilling effect on the authority, sanctity, integrity and independence of the judiciary. The uncertainty of the processes and grounds on which suspected corrupt judges can be sanctioned would affect the capacity of all judges to act independently, and the public confidence in the judiciary. Judges, like other constitutional functionaries, must face the law if they depart from or deceive the law, such as when they are suspected of engaging in corruption, of which is not the case in Ademola's situation. What the DSS has done is an unguided heavy blow to the independence of the judiciary, and a dangerous precedent that should not be allowed to stand by men of honour. The value of the principle of judicial independence is that it protects judges from arbitrary sanctions by the government. The way the Nigerian state dispenses justice and treats its judges will show the moral and legal character to which it can pretend. The judiciary and the separation of powers, and its proceedings must be in line with constitutional and international standards of due process and fair trial. Without an independent judiciary, the concept of the rule of law would become a mockery. The raid which many noted is a bad taste and a return to anarchy prevalent during the military era threatens democracy and the rule of law. It is expected that people of goodwill and lovers of democracy and the rule of law should stand firm to condemn in its entirety the absurd Gestapo invasion of the private residences and arrests of judges at odd hours. It is not only unlawful but also a threat to due process, usurpation of the responsibilities of the Nigerian Police, Economic crimes agencies such as the EFCC and ICPC, or the Nigerian Judicial Council(NJC), of whom are saddled with the responsibility to investigate and sanctions corrupt elements in the society. There is no way the actions of the agency can be justified in the Nigerian constitution which established the DSS. There are procedures of the law in going about judicial corruption but it is quite unfortunate to learn that the DSS flouted them all. Even when they overstretched their limits and conduct investigations into the activities of judges suspected to be corrupt, they should be able to hand over their findings to the appropriate government institutions such as the Police, EFCC or the NJC for prosecution and punishment. The need to sanitize and purge the judiciary of corruption and erring judges is not wrong on its own when carried out genuinely, but the barbaric manner at which the DSS was deployed to invade private houses of judges is what is absolutely wrong. It is no longer in doubt that the alleged assault and intimidation of judicial officers by agents of the Nigerian government is a calculated attempt to cajole the judiciary and compel it to do its biddings; to compromise and influence them in their judgements, particularly if the conduct is viewed against the persistent complaint by the presidency against the judiciary which President Buhari once called his main headache in the fight against corruption. The world must rise up, fight and put a stop to another reign of Adolf Hitler, by calling a spade what it is. Buhari represent everything ignoble and evil, he is a virus that has encroached every arm of the government and must be given maximum treatment. This is the right time for the senate to impeach him having violated every law in the constitution. Revolution is imminent in Nigeria and Buhari's ideology is bound to trigger the collapse of the Lugardian enterprise precipitously than we imagined. They system is controlled by corrupt staff!...so they can still delete the information from the system.